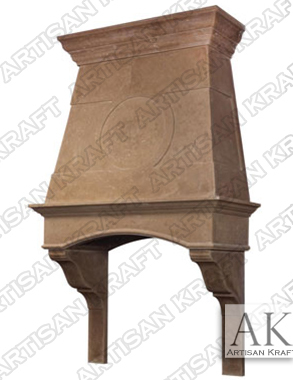 Charleston Decorative Range Hood is pictured in a dark cast stone finish. Charleston has two corbels that are optional and drop down to the kitchen marble counter top. An arched large header with an overhood above it. The overhood has a panel with a circle in it. This is all finished to the ceiling or the desired hight with a crown. This is pictured made from cast stone. It can be made from other materials like marble and limestone.